1. P can do a piece of work in 12 days and K can do the same job in 15 days. If K will leave three days before the work is completed, then how many days P and K work together? 2. An article is marked Rs. 2500 and sold it on Rs.2250. What is the reduction percentage as discount? 3. Average of 40 observations is 16. If 2 is subtracted from each observation, then what will be the new Average of the observation? 4. A train can travel 25% faster than a car. Both start from point A at the same time and reach point B 165 km away at the same time. On the way the train takes 40 minutes for stopping at the stations. What is the difference in the speeds (in km/hr) of train and car? 5. If 3A = 2B and 2B = 3C, then what is A: B: C? 6. In the following question, select the missing number from the given series. 15, 17, 20, 22, 25, 27, 30, 32, ? 8. How many numbers are there from 300 t0 500 which are divisible by both 4 and 7? 9. Which is the largest among the numbers √5, 3√7 and 4√13? 10. What is the sum of first 30 even numbers? 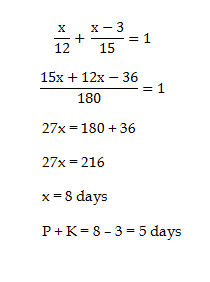 1) P can do a piece of work in 12 days and K can do the same job in 15 days. If K will leave three days before the work is completed, then how many days P and K work together? 2) An article is marked Rs. 2500 and sold it on Rs.2250. What is the reduction percentage as discount? 3) Average of 40 observations is 16. If 2 is subtracted from each observation, then what will be the new Average of the observation? 4) A train can travel 25% faster than a car. Both start from point A at the same time and reach point B 165 km away at the same time. On the way the train takes 40 minutes for stopping at the stations. 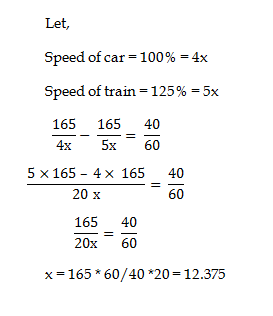 What is the difference in the speeds (in km/hr) of train and car? 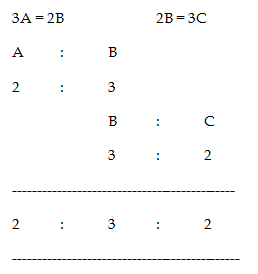 5) If 3A = 2B and 2B = 3C, then what is A: B: C? 15, 17, 20, 22, 25, 27, 30, 32, ? 8) How many numbers are there from 300 t0 500 which are divisible by both 4 and 7? 9) Which is the largest among the numbers √5, 3√7 and 4√13? 10) What is the sum of first 30 even numbers?